Gifts for Nana always take on sentimental meaning. 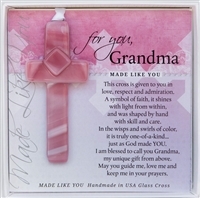 Our wide variety of Nana gift ideas are guaranteed to melt her heart. A new grandchild completes Nana's circle of love. Give new Nanas that special gift to commemorate such a joyous occasion. Your Nana is sure to treasure our classic poetry cards, perfect for new grandmothers. Or, perhaps you'd like to give her our heartwarming grandchild handprint frames, which are sure to leave a lasting impression. We also carry ultrasound frames that are perfect for new Nanas? Whatever Nana presents you consider, know that she's sure to cherish the gift and affection forever. All presents mean more when they're personalized just for the recipient, and Grandparent Gift Co. offers free personalization with your purchase.